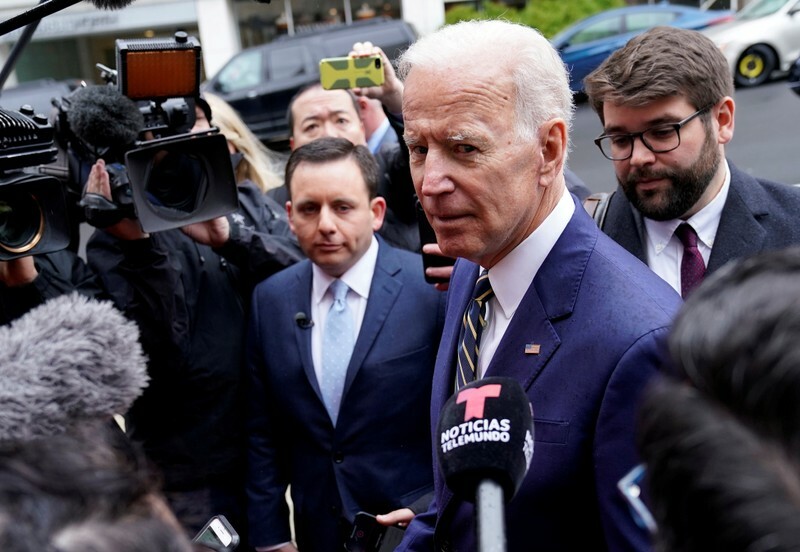 Former Vice President Joe Biden hours ahead of launching his presidential campaign urged top donors and supporters to contribute heavily in the first 24 hours and first week following his announcement. Biden said world leaders had called him, “almost begging me to do this, to save our country, save the world,” according to three sources who spoke with Politico. “The money’s important. We’re going to be judged by what we can do in the first 24 hours, the first week,” Biden said Wednesday during a conference call with top donors and supporters. Per The Washington Post, Biden, 76, is set to announce his run for president Thursday in a video. He is expected to travel to Pittsburgh, Iowa, New Hampshire, and South Carolina over the next week for campaign events. Sen. Bernie Sanders, I-Vt., topped Democrats in the fundraising race in the first quarter, bringing in $18.2 million, followed by Sen. Kamala Harris, D-Calif. (nearly $12 million), former Texas Congressman Beto O’Rourke ($9.4 million) and South Bend, Indiana, Mayor Pete Buttigieg (nearly $7 million). NEW YORK (Reuters) – Former Vice President Joe Biden, expected to declare his run for the 2020 Democratic presidential nomination on Thursday, leads all other candidates in the race and draws his strongest levels of support from minorities and older adults, according to a new Reuters/Ipsos public opinion poll. Biden, 76, who has sought the Democratic presidential nomination twice before, remains widely popular since he left the White House in 2016 after two terms as vice president. The former longtime U.S. senator will announce he is seeking the Democratic nomination https://reut.rs/2IAxNys on Thursday, a source familiar with the plans said on Tuesday. All three appear to have stronger bipartisan appeal than Republican President Donald Trump. According to the poll, 44 percent of all adults said they have a generally favorable view of Trump. Thirty-two percent of adults who are 55 years old and older said they would vote for Biden over other candidates. And 30 percent of nonwhite adults, including about 4 in 10 African-Americans, said they would back Biden for the nomination. Their preferences may change once they get to know other candidates for the Democratic nomination. Former Vice President Joe Biden leads all other candidates for the 2020 Democrat presidential nomination and draws his strongest levels of support from minorities and older adults, according to a Reuters/Ipsos public poll released on Wednesday. Another 15 percent said they would support U.S. Senator Bernie Sanders of Vermont, who ran a competitive campaign for the Democrat nomination in 2016. Biden, 76, who has sought the Democrat presidential nomination twice before and is expected to announce a third run later this week, remains widely popular since he left the White House in 2016 after two terms as vice president. Establishment Republicans could not do it, neither could Hillary Clinton, media resistance, nor special counsel Robert Mueller’s investigation. Now, Democrats are desperately sorting out which primary candidate will be the best to beat President Donald Trump, The Hill reported, citing pollsters. “[Democratic voters are] hungry for a candidate to take on President Donald Trump,” Quinnipiac University pollster Tim Malloy said, per the report, explaining how former Vice President Joe Biden, Sen. Bernie Sanders, I-Vt., and ex-Rep. Beto O’Rourke, D-Texas, are the leading candidates atop the poll right now. “Electability” (56%) almost doubled up “echoed beliefs” (33%) in their preferred trait of their Democratic candidate in a February Monmouth University poll. It is electability that justifies Democrats leading with three white men in a diverse field of presidential candidates. Age, race, and gender “take a back seat” to electability, according to the Quinnipiac poll. Polling is being “driven by this intense dislike of Trump,” Lake told The Hill. Former San Antonio, Texas Mayor Julian Castro is among the top five Democratic presidential contenders favored by Hispanic voters, a new poll reveals. The survey was conducted by the polling firm Latino Decision and the National Association of Latino Elected and Appointed Officials. The results were detailed in a story by The Hill. 58% favor Sen. Bernie Sanders, I-Vt.
43% favor Sen. Kamala Harris, D-Calif. The Hill noted Castro is the only Hispanic currently running for president. The poll, conducted April 9-15, surveyed 606 Latino registered voters. The margin of error is 3.9 percentage points. South Bend, Ind., mayor and Democratic presidential contender Pete Buttigieg is in talks with Fox News about appearing in a town hall event, The Hill reported Tuesday. The intention was announced a day after Sen. Bernie Sanders, I-Vt., became the first 2020 Democratic candidate to go onto Fox for a town hall event. Democratic National Committee chairman Tom Perez announced ast month Fox would be barred from hosting any of the party’s primary debates. Buttigieg has been gaining attention in his long-shot bid; an Emerson College poll released Monday showed Sanders at 29% among Democratic respondents, former Vice President Joe Biden at 24%, Buttigieg third with 9%, Sen. Sen. Kamala Harris, D-Calif., former Democratic Texas Rep. Beto O’Rourke each with 8%, and Sen. Elizabeth Warren, D-Mass., at 7%. Former Rep. Beto O’Rourke, D-Texas, released 10 years of his tax returns Monday, reporting $366,455 in adjusted gross income in 2017 for him and his wife, Amy. O’Rourke, who is running for president in 2020, joined a growing list of Democratic presidential contenders to put their personal finances on display. O’Rourke, who lost a tight race against Sen. Ted Cruz, R-Texas, last November, paid $81,019 in federal income tax in 2017, and donated just $1,166 to charity. Sen. Bernie Sanders, I-Vt., is developing a risky strategy of reaching out to President Donald Trump voters, stumping last week in Wisconsin and Michigan — and appearing on a Fox News-sponsored town hall Monday, The Washington Post reported. The approach will be tested not only in Wisconsin and Michigan, but Pennsylvania, too — all part of his current campaign swing, where many white, working-class voters were drawn to Trump’s populist message in 2016. Yet many of the Democratic gains in the 2018 election were made by candidates who were in a more traditional Democrat mold — including in Wisconsin and Michigan, where Democrats nominated more traditional candidates for governor and captured both seats from Republicans. According to the Post, Sanders’ approach also will be tested with the the expected candidacy of former vice president Joe Biden. Biden’s bipartisan approach would sharpen the contrast between the field’s “unifiers” — Biden, Sen. Cory Booker, D-N.J., and former Texas Democratic Rep. Beto O’Rourke — and partisans like Sanders and Sen. Elizabeth Warren, D-Mass. Sanders’s supporters say voters are deeply frustrated and looking for a leader who will shake things up, noting 11 percent of voters who picked Sanders in the 2016 Democratic primary went on to vote for Trump in the general election, the Post reported, citing an American National Election Studies survey. Another 8 percent voted for minor-party candidates, and Sanders loyalists think he’s got a shot at them as well. Others think Sanders’ message is too extreme. “I think when people find out that certain candidates want to take away people’s employer-sponsored health care, that’s going to be very worrisome for some Democrats, especially in some of these affluent suburbs,” Ian Russell, former executive director of the Democratic Congressional Campaign Committee, told the Post. Republicans, meanwhile, are ready for a run against Sanders. IOWA CITY, Iowa (Reuters) – U.S. Senator Kamala Harris held just one public event this week during her third trip to Iowa since joining the contest for the 2020 Democratic presidential nomination, a town hall at the University of Iowa where she talked about her plan to raise teacher pay. Former Texas congressman Beto O’Rourke, for example, went to 23 events across 10 counties on his second trip to Iowa. U.S. Senator Cory Booker of New Jersey attended 14 events in 11 counties during two visits, with a third scheduled next week. Harris’ campaign thinks its targeted approach will allow her to build momentum in Iowa, while freeing up resources to invest more heavily in the path they see as crucial to her winning the Democratic nomination: California and the U.S. South. Harris’ tactics carry some risk. Iowa voters play an outsized role in picking U.S. presidents, and many have come to expect frequent face time with White House hopefuls. 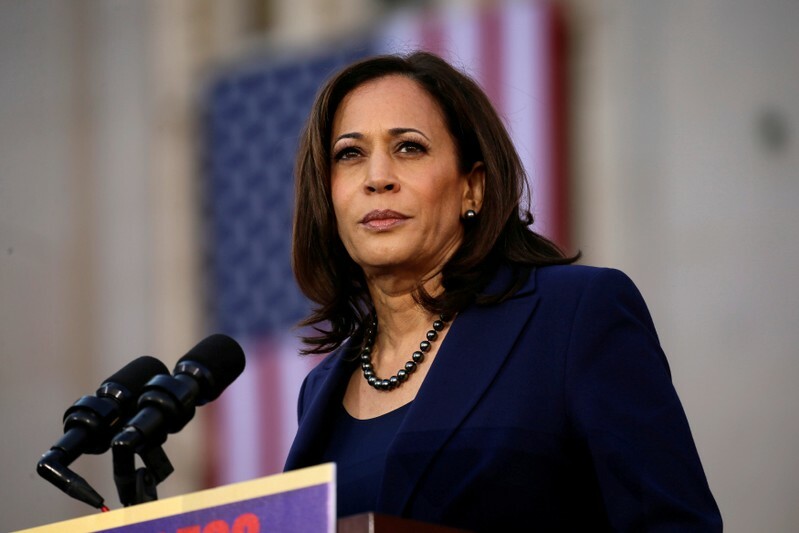 Harris told the women the 2016 election of President Donald Trump, the likely Republican candidate in 2020, was an “inflection point” in U.S. history.